Easter is a great time for the entire family—all the bright colors, goodies, and fun activities make it a super fun time for people. However, when it comes to your pets, there are a couple of extra things to consider while preparing for this holiday. While your cats and dogs will likely enjoy most of the outdoor activities and all the new people they meet, there are some aspects of this holiday that can be dangerous or harmful for them. Let’s go through the list and keep your furry family safe! There are some Easter favorite plants and flowers that you’ll commonly find decorating homes which can have an adverse effect on your pets if consumed. Easter lilies are particularly bad for cats—if your pet is unfortunate enough to eat these, they can experience acute kidney failure. This condition can happen to your cat even if they only nibble on a couple of petals. Even just the lily pollen can cause this condition! Incidental pollen found around the house can get onto your cat’s paws and fur, and once they groom themselves they can’t help but ingest it. The safest option is to simply not have these lilies in your home—or if you absolutely must, place them in a room where cats can’t get to. Cyclamens are common throughout the year, but are an Easter favorite. Their roots are the prime offenders, but the flowers can also cause digestive problems for your cats and dogs. Small amounts can cause severe diarrhea, while larger doses can result in seizures and possibly death. Long story short—don’t let your pet munch on any new plants or flowers you’ve brought into the house, and if you do bring in these things, check that they’re pet-safe beforehand! While everyone knows the dangers that chocolate pose for cats and dogs, there are other goodies in the Easter basket that can prove just as harmful to your pets! The main offender here will be sugar-free gums and candies, even if they don’t contain any chocolate. Xylitol, a sugar substitute, can be highly toxic to dogs—even if it’s better for humans than plain old sugar or corn syrup. Small amounts of xylitol can cause your dog’s blood sugar to drop rapidly, leading to possible seizures or even death. Larger amounts of xylitol on a regular basis can lead to canine liver failure, which is very difficult to treat. Any kind of candy ingested by your pets should be immediately addressed with a vet visit! Many of these Easter treats were never made with pet consumption in mind, and it’s typically difficult to find out exactly what the ingredients are. It’s better to err on the side of caution and get your pet checked out as soon as possible. While we understand that it’s hard to resist feeding our pets the same thing we’ve eaten (especially when we’ve already had too much and can’t finish our plates! ), it’s not a good thing at all. Your pet may beg and whine and look at you with their adorable faces, but letting them munch on our leavings isn’t always safe. Many of the traditional Easter foods contain ingredients that can be dangerous for your pets. Easter is one of the busiest times of the year for vets who deal with dogs and cats that have either gotten poisoned by or overindulged in human food. 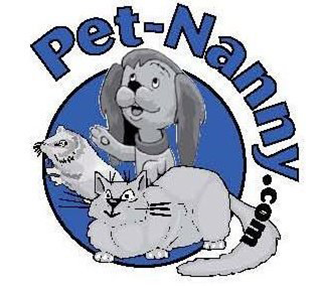 The safest thing for your furbabies is to simply let them eat their own pet food! 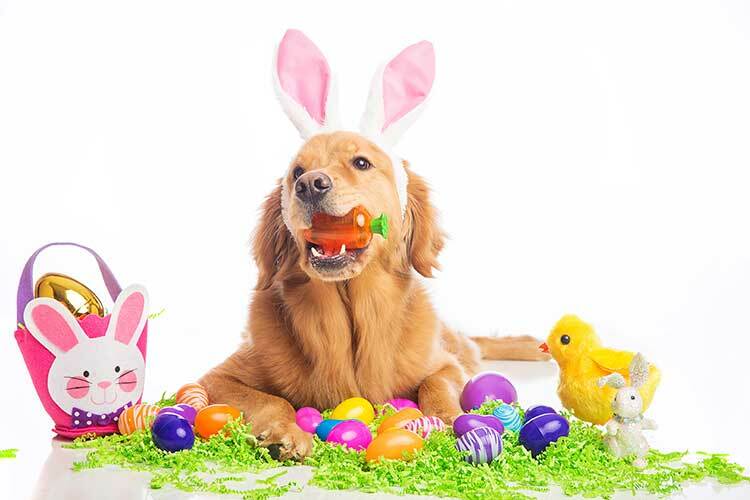 If you really can’t resist, give them a special pet-friendly treat—there are many Easter-themed ones out there—but don’t give them your leftovers. Try and stay one step ahead of your pets and keep your eyes open for any unforeseen dangers of this colorful holiday.